For four weeks already, Mr Green Casino is running a promotion that involves the Ugly Duckling inspired NetEnt slot Scruffy Duck™, but it’s only this last week that two NetEnt slots are involved. Until 29th July, you can earn 25 free spins every single day by playing the Fairytale Legends: Red Riding Hood™ video slot at Mr Green Casino. All the free spins you earn during this week will be available for the Scruffy Duck™ video slot which has been selected by Mr Green as Game of the Month. I think I know why Scruffy Duck™ is the chosen one this month. 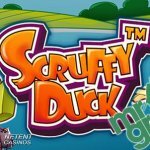 Scruffy Duck™ has been exclusively available at Mr Green Casino before the video slot was launched globally by NetEnt in May 2017. 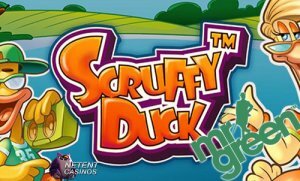 Thanks to the launch of Scruffy Duck™, players at Mr Green Casino are able to enjoy the shortest version ever of The Ugly Duckling as this NetEnt slot has been inspired by the fairytale which was first published 11th November 1843 by the Danish author Hans Christian Andersen. Although this video slot isn’t part of NetEnt’s Big Book of Fairytales (the Fairytale Legends series), the game is still based on one of the most famous fairytales. This how the little scruffy bird found its way to the reels. Feeling different from the other ducks, it’s only a matter of time the ugly duckling turns into a beautiful swan, the most beautiful of them all. Don’t expect any greatness from the graphics, but I’m sure that the mix of video slot feature will keep you captivated for a while. The Expanding Wild, for example, is having a very important role to play during the main game and it’s the Expanding Wild that appears on a reel as the ugly duckling but will turn into a swan while expanding. The shortest version of the Ugly Duckling ever! Besides the Expanding Wild, you can also expect five extra video slot features of which one will be activated during the Free Spins feature. It’s this fairy tale you can earn up to 150 free spins for this week with a maximum of 25 free spins each day. 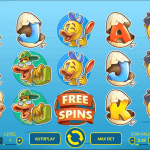 The free spins will be available for the Scruffy Duck™ video slot while free spins can be earned by playing another fairytale-themed video slot. It is today that the Mirror Mirror™ slot became available at Mr Green Casino, being the third and last instalment of the Fairytale Legends™ series including Fairytale Legends: Red Riding Hood™, Fairytale Legends: Hansel and Gretel™, and Fairytale Legends: Mirror Mirror™. A game you should give a try at one point, but this week I would rather recommend Fairytale Legends: Red Riding Hood™ as free spins can be earned every single day while playing this game until the 29th of July. Although Fairytale Legends: Red Riding Hood™ was the first chapter of NetEnt’s Big Book of Fairytales, it’s still my favourite slot game from the Fairytale Legends series thanks to the Beware the Wolf Bonus feature. You being able to earn free spins for the Scruffy Duck™ video slot this week is a good reason to play this video slot, but the Beware the Wolf Bonus feature is definitely another reason! If you decide to join Red Riding Hood on her journey through the forest, you’re about to meet NetEnt’s very own fairy on the way who’s having several surprises prepared for you. Her magic wand can bring you one of the spellbinding Random Features, but you must be careful you don’t fall into the Big Bad Wolf’s traps in the Beware the Wolf Bonus Game. There will also be Sticky Wild Re-Spins, a Fairy Magic Spin Feature, a Fairy Wild Spin Feature, a Fairy Surprise Feature, a Free Spins Bonus Feature and the Coin Win Bonus Feature. 150 Free Spins are Remaining in Scruffy Duck! 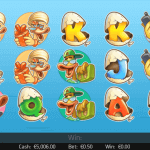 They’ve gone ducking-crazy at Mr Green Casino selecting the Scruffy Duck™ slot as the Game of the Month. If you care about free spins, you better join Mr Green on the best duck hunt around. If you decide to do so, an amazing 25 free spins can be earned each day until Sunday 29th July. All you need to do is to play at least 50 spins on the Fairytale Legends: Red Riding Hood™ at Mr Green within a day. 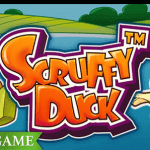 Make sure your bets are at least €0.25 in order to qualify for the 25 free spins for the Scruffy Duck™ video slot. Do this every day until Sunday and you’ll earn yourself an amazing 150 free spins for the Scruffy Duck™ video slot. The 25 free spins for the Game of the Month will be available directly after you’ve played your 50 spins with real money on Fairytale Legends: Red Riding Hood™. Magic is in the air!